As I've looked at these new apps day by day, I started noticing something peculiar. No, it wasn't the amount of fart apps and soundboards - those, while annoying, are still legitimate applications, which, thanks to Google's openness, deserve a place in the Market just like any other app. What I noticed was that the same several apps appeared in the list over and over and over again, day after day. It's been weeks, and this behavior has not subsided - in fact, it's quickly getting into a disastrous state. Let me explain what is going on here. 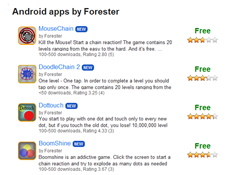 The developer of the following "games": DoodleChain 2, BoomShine, Dottouch, and MouseChain, represented by at least 2 developer accounts - Forrester and Woodman, published them to the Market and probably got a few bad reviews and a low overall rating, most likely because those "games" are bad. Really bad. 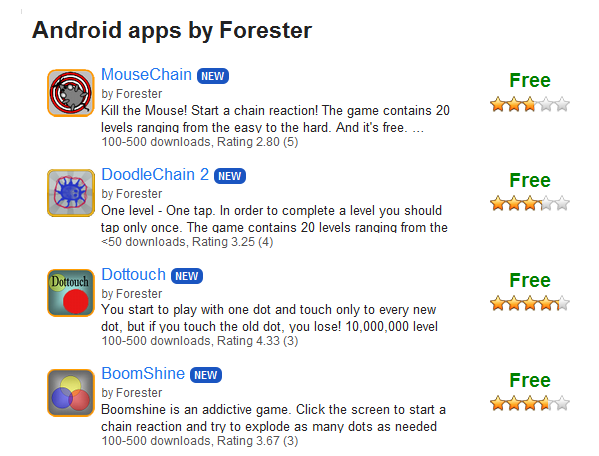 Update: Found 2 more accounts spamming the same, and even more, apps: FastAndFun and Koks. It's getting more ridiculous by the hour. Just look at the Market account for Koks on a Market tracker that doesn't seem to removed deleted apps: [email protected]. So, what do they do after that? They pull down the apps, rename the package names (pname), which is how Google identifies each app internally, by appending "001" and republish them back to the Market. 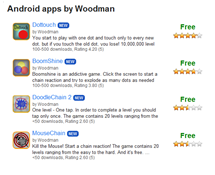 Immediately after, they rate all of their apps 5 stars and end up getting into the Newest Apps list in both the Google Market and sites like AppBrain. Slowly, people vote them down again, so they rinse and repeat, gaming the Market over and over. 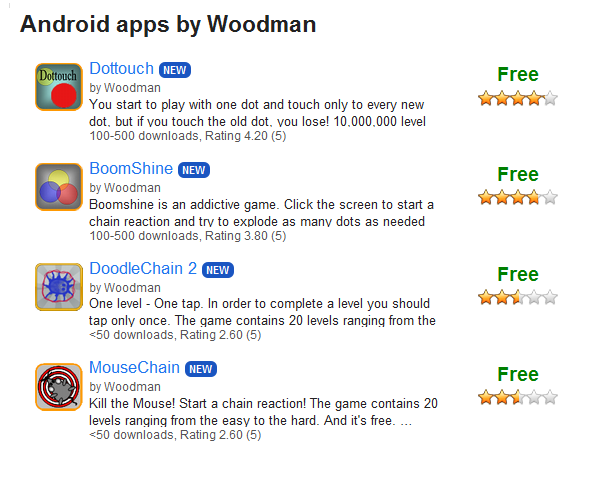 I am calling you out, Forester/Woodman. Cut this crap out, we are onto you, and we like neither your apps nor your spammy tactics. 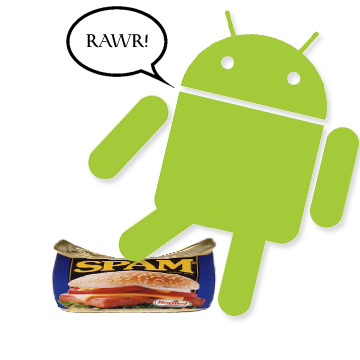 There is no protection currently in place in the Android Market to prevent it from happening. 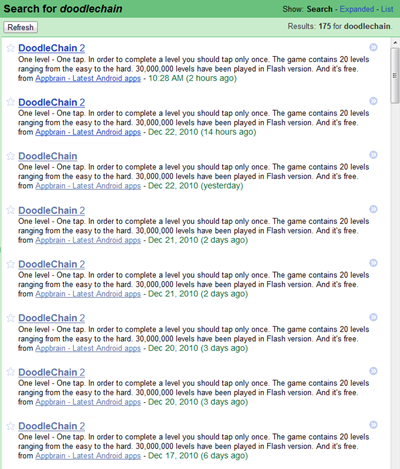 You can easily mark comments as "spam" but with apps, it takes a lot more effort. You need to install the app, uninstall it, and mark it as malicious, but either Google is not paying any attention to these reports and the strategy doesn't work or not many people are onto these spammers yet, because both dev accounts are still active now more than ever. 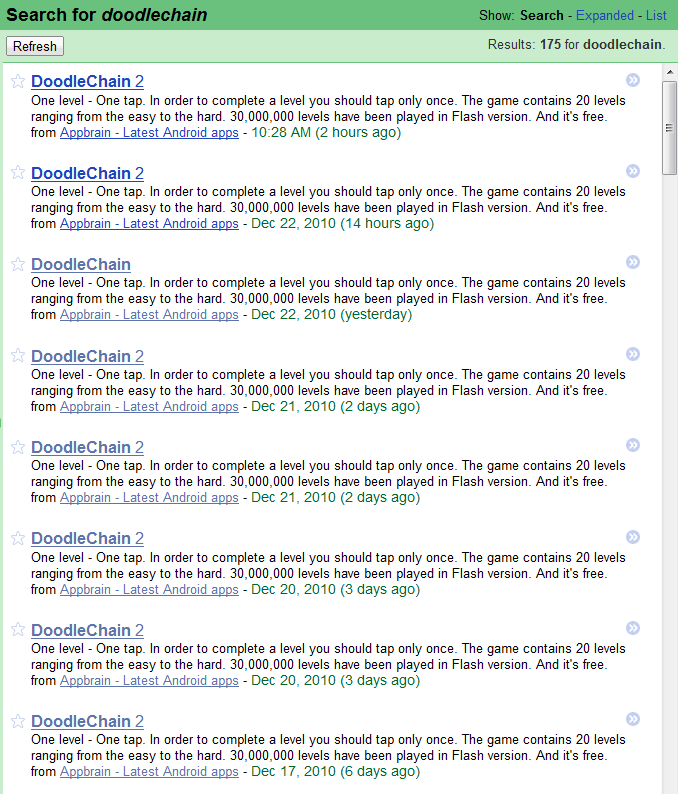 Google, you are being gamed - what are you going to do about it? Edit: As Anas pointed out in the comments, an app can actually be flagged without the need to download it - just scroll to the bottom and select "Flag as inappropriate." You know what to do, people. Here are the developers' email addresses: fore[email protected] (Forester), [email protected] (Woodman), [email protected] (FastAndFun), [email protected] (Kox) - let them know what you think of their actions. Update: I have reached out to Google for comment.